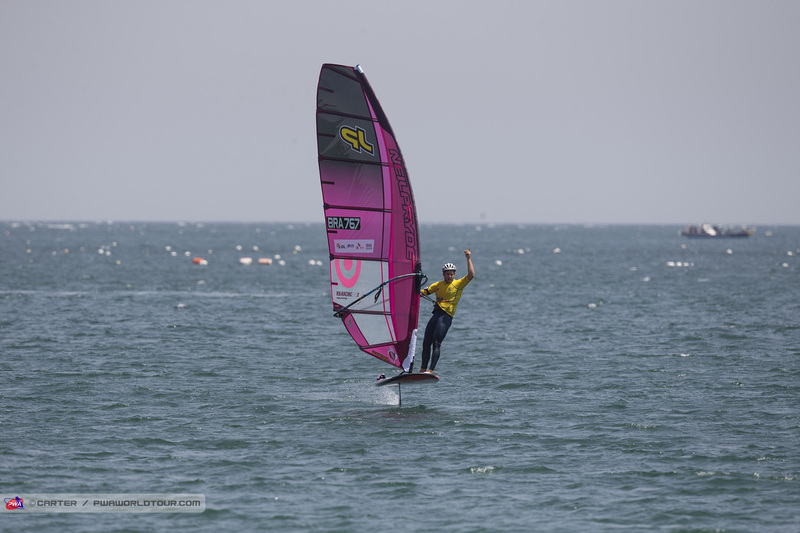 Jinha Beach provided a pulsating end to the 2018 Ulsan PWA World Cup as the thermal wind kicked in as promised, which allowed 4 thrilling eliminations of foiling to be completed in winds ranging from 7-22 knots. The conditions today showcased foiling for the exciting and dynamic discipline that it is with brilliant racing manoeuvres, hairy moments and plenty of overtaking opportunities meaning you couldn’t take your eyes off the action. Over the 4 races completed, there were 4 separate winners… Gonzalo Costa Hoevel (Starboard / Severne / Chopper Fins), Mateus Isaac (JP / NeilPryde), Amado Vrieswijk (JP / Severne) and Antoine Albeau (RRD / NeilPryde) - illustrating the current unpredictability of foiling, which only adds to the excitement currently surrounding this new discipline. Heading into the 4th elimination there was all to play for with the discard to come and almost any of the top 9 sailors at that time had a legitimate chance of winning. Brazil’s Mateus Isaac took the early lead in the foiling after winning the opening elimination in style, but he soon plummeted down the rankings after finishing 23rd in the next race. However, to the 24-year-olds credit, he didn’t let this unsettle him and gave himself every chance heading into the final race after recording a 5th place finish in Elimination 3. Antoine Albeau (RRD / NeilPryde) held the event lead heading into the final race but was basically level on points with Isaac with both sailors holding a win and a 5th place before the discard. A top 4 finish for either sailor would guarantee one of them the victory, with whoever beating who taking the event win, however, should they miss out on the top 4 then Costa Hoevel would be right back in contention. In the final race of the event, Costa Hoevel did everything in his power to record back-to-back event victories as he finished with a clinical bullet, but in the end, the Argentine would have to settle for 2nd place here, which keeps him firmly at the top of the world rankings after two events. The current world tour leader may be slightly frustrated though as seaweed in the opening race, just before the start limited him to a 14th place and in the end, there was only 1 point between himself and eventual winner - Mateus Isaac. Isaac will be rightfully delighted with his efforts over the last week, which has seen the Brazilian earn his best result yet in the slalom - 4th - while 4th place in the final foil race today saw him secure the top spot on the podium for the first time in his career. A superb victory here sees Isaac rise to 2nd in the overall foil rankings after a 6th place in Japan and he looks like a sailor truly in form and one who has progressed over the winter. Alexandre Cousin (Patrik / GA Sails / Chopper Fins) was the only member of the top 5 not to win a race, but the young Frenchman’s consistency, which included two 2nd places over the 4 races, earned him a deserved podium finish - 3rd - while denying Albeau and Vrieswijk a place on the podium by just 0.7 of a point. During the opening two events, Vrieswijk has shown that he has all the potential to win races and it won’t be long before he earns his first podium in foiling. This time around the Bonairean walks away with 4th. Albeau was angered not only to miss out on the event title but also the podium after hitting a piece of rope on the second lap of the final, which resulted in an 8th place. If AA had have finished just one place higher he would have secured 3rd, but even so he maintains his place on the overall foil podium. We will take a full look at all the results in the event summary, but a quick congratulations to Delphine Cousin Questel (Starboard / S2Maui) and Matteo Iachino (Starboard / Severne / Chopper Fins), who are officially the Women’s and Men’s Slalom Champions of Jinha Beach and both lead the overall slalom rankings after the Asian leg of the tour. That concludes what has been an amazing Ulsan PWA World Cup with Jinha Beach providing a superb blend of conditions over the last 6 days.